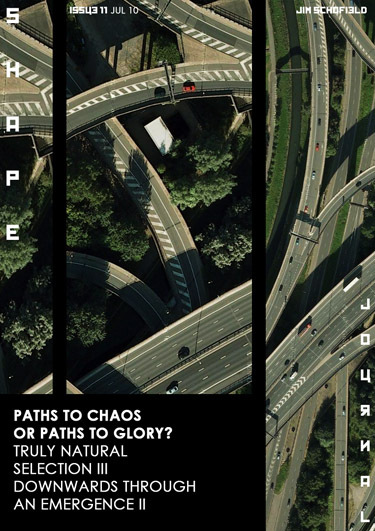 Paths to Chaos or Paths to Glory? Welcome to Issue 11 of SHAPE Journal. Firstly, we would like to apologise for the slight delay in publishing this issue. We hope to be back on track for the next edition, as well as a new special issue on The Theory of Emergence next month. This issue begins to lay the foundations for that theory. Although the crucial step to such a theory has already been made, and the supporting series of papers finally establishing it, are already in existence and await publication, the actual ascent to get this author into a position from which he was able to produce such a contribution, is considered absolutely essential, and the series entitled Paths to Chaos or Paths to Glory? commencing in this issue, was an important step along that road. It is about whether Reality is merely winding down towards a final dark, inactive oblivion, or actually self-developing to ever new heights. The logic of our usual pluralisitic approach to science inevitably leads to the former position, as embodied in the Second Law of Thermodynamics while the efforts of holist contributors, such as Darwin, lead us in an entirely contrary direction.